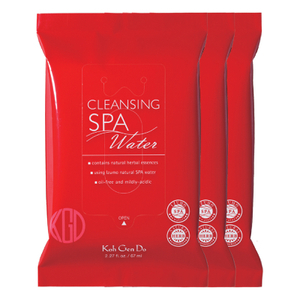 Refresh your complexion Koh Gen Do Spa Cleansing Water Cloth; a pack of face wipes soaked in the brand's signature blend of thermal mineral water and conditioning botanical extracts. Easy to use, the luxurious towelettes effectively dissolve dirt, impurities and stubborn waterproof makeup without the need for rubbing or rinsing. A dose of mineral-rich White Birch Sap (harvested for only three weeks in early Spring) nourishes and softens skin for long-lasting comfort. Skin feels soothed, rejuvenated and deeply replenished after use. Housed in a resealable pouch that is ideal for use on-the-go. Not tested on animals. Oil and alcohol free. Free from artificial colors, synthetic fragrance and mineral oil derived from petroleum.